- I want to have a record someday to look back on the challenges I have overcome, and the amazing things I have been able to accomplish despite having a debilitating illness and a life threatening disease. -I originally starting writing because I wanted my family and friends to be updated about surgeries and progress during my diagnosis and treatment. It was too emotionally difficult for me to tell people over and over again what happened at my appointment, so blogging and writing it all down was easier for me. - I think pituitary diseases are important and often overlooked, and definitely underestimated. I wanted people to know that it isn't a small deal, it's a HUGE deal that many people don't survive. -I think Cushing's is under diagnosed and I wanted to help people that may have Cushing's but never knew it existed. 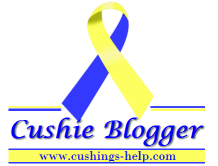 -For people with Cushing's, either newly diagnosed, searching for a diagnosis, or post-Cushing's. I want them to have a story that they can relate to, and experiences to learn from. -The emotional toll that comes from struggling with an undiagnosed illness, finally getting diagnosed, being treated and having those treatments fail, and maybe having relapses is huge. I need an outlet to let those feelings of grief, anger, and accomplishment out. Sometimes it's hard to complain to the same person all the time, so this helps me get it out without being a burden to someone. -I want more health professionals to start taking us seriously. I was not a fat person who didn't exercise and overate. I was a healthy person that became obese because I had a serious endocrine disease. I had a lot of doctors tell me I needed to seriously diet and consider gastric bypass. That's so discouraging when you're fighting for your life. -I want people to understand what I'm going through. It's not just a small surgery, or a tough appointment. It's a lifetime of maintenance, and more surgeries and treatments are unfortunately a part of my life for the rest of my life.